Deputy Director of Suvarnabhumi Airport Maj Kamol Wongsomboon. 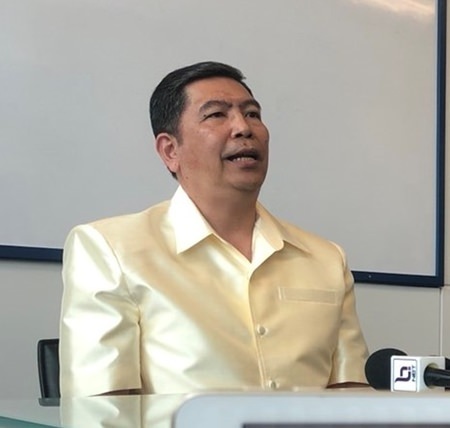 Executives of Suvarnabhumi Airport have assured the public that no special payments have been demanded for Premium Lane passes, from those who want to bypass long immigration queues. Deputy Director of Suvarnabhumi Airport Maj Kamol Wongsomboon, who is currently acting director of the airport on behalf of Airports of Thailand (AoT), has confirmed no extra payments have been requested in the sale of Premium Lane passes, explaining that AoT is only responsible for inspecting the sales, which are handled by Airline Operators Committee (AOC). He indicated that all travelers with proper passports can use the Premium Lane, which is available in zones 2 and 3 on the fourth floor of the passenger terminal. Maj Kamol acknowledged that travelers are sometimes subjected to long lines as Suvarnabhumi Airport, which is currently only able to handle 45 million people a year, sees 60 million arriving on average. More officials and facilities have been added to alleviate the situation. Premium Lanes were created under an agreement between AOC and Immigration Police in line with tourism policy. First and business class passengers are provided with access to the lanes when traveling out of Thailand. AOC produces and manages the sale of Premium Lane passes.